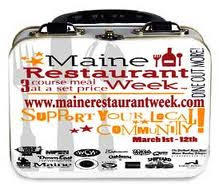 Maine Restaurant Week is back and offering great deals for New England foodies from March 1-12, 2011. 80+ restaurants have created three-course prix-fixe menus ($20-$40 per person), and various cook-offs, book signings, free giveaways will spice up this year’s festivities. Among my favorites offering a special meal this week is Sea Glass at the Inn by the Sea in Cape Elizabeth, near Portland. Executive Chef Mitchell Kladrovich makes me nostalgic with his all-things-Maine menu throughout the year and especially during restaurant week with local Damariscotta oysters with a champagne mignonette sauce, grilled Atlantic salmon served in a red wine mustard sauce with piquillo relish, and a New England favorite, peanut butter, mixed into a parfait with peanut butter and vanilla gelato, caramelized bananas, and honey-roasted peanuts. The Signature Event kicks off Restaurant Week today from 5-8pm. Celebrate Restaurant Week with Maine’s premiere bartenders and dessert chefs who will serve up their tastiest creations at the Masonic Temple (415 Congress St., Portland). Friendly competition is the name of the game here, as several of Maine’s top chefs will face-off in the “How Sweet It Is” and “The Art of Dessert” people’s choice contests. Signature cocktails from the area’s master mixologists will also fill the room as bartenders mix up exotic concoctions and vie for the top honor that went to Tom Laslavic from Natalie’s last year. Tickets are $35/person. On Thursday, March 3 from 7-9:30pm, Gabrielle Hamilton, award-winning chef and owner of NYC’s Prune Restaurant, will give a short reading of her first book, Blood, Bones & Butter: The Inadvertent Education of a Reluctant Chef at Grace Restaurant (15 Chestnut St., Portland). 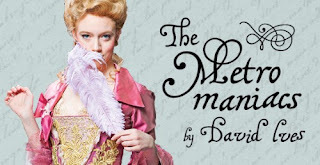 This event includes a book signing and a roast lamb dinner inspired by Hamilton’s book. All-inclusive tickets are $120 per person; reservations can be made by calling Grace Restaurant at 207-828-4422. The saying “breakfast is the most important meal of the day” certainly holds true during Restaurant Week at the 2011 Incredible Breakfast Cook-off. Sample meals from 12 of Maine’s “Champions of Breakfast” and vote for your favorite at the Sea Dog Brewing Co. (125 Western Ave, South Portland) on Friday, March 4 from 7-9am. Farmer’s Table, Bintliff’s American Café and Sea Glass will compete alongside other top restaurants to become Maine’s “Champion of Breakfast.” The Good Table restaurant’s Crème Brûlée French Toast is the meal to beat, so stop by to see these top restaurants up the ante with Maine’s most scrumptious breakfast dishes. As a bonus for attending the Cook-Off, you’ll receive a pair of Portland Pirates hockey tickets. Tickets are $15 per person, $27 per pair and can be reserved here. Combo tickets for the Signature Event and the Incredible Breakfast Cook-off cost $45 per person. Inspired by Gabrielle Hamilton’s food writing event? Check out the sixth annual 2011 Slow Food Writers Night at SPACE Gallery (538 Congress St.) on March 10 from 6:30-9:30pm. Enjoy authentic local cuisine from land to sea and learn about various food topics from farming to Italian food from industry experts. Tickets are $20-$25 and can be purchased here. Check in for updates all week long at www.mainerestaurantweek.com. Hi Meryl! First of all, congrats for your posts. They are really interesting and helpful. Let me ask you a question: have you ever been to Uruguay? I have been there last year and ate the best steaks I will probably have the chance to taste. I've heard its food and wines are highly considered by experts worldwide, but I did not have the chance to read an opinion of an expert about Uruguayan gastronomy. I hope you go to Uruguay and share your experience on its food. You will surely like it!